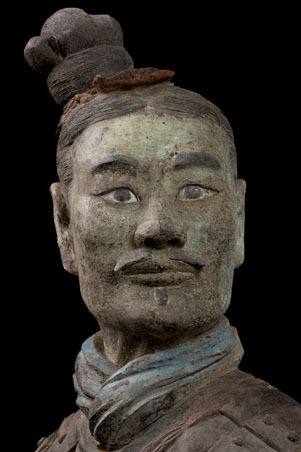 China'a Terracotta Warriors - The First Emperor's Legacy. So kewl!!!!! It's only at the museum until the 20th (actually, due to heavy ticket demand, the museum just extended the show by one week and added/extended the viewing times) and I was adamant that I wanted to see it, so even though DH wanted to work on the bathroom ceiling in the small house to get the plastering done, he acceded and we will be at the Institute instead. I'm so excited. 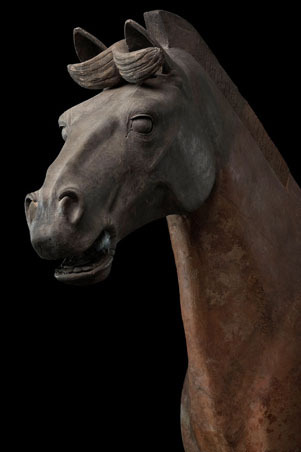 There are eight of the terracotta warriors and TWO HORSES in the exhibit (along with more than 100 other objects). I hope the exhibition catalog is good, I do buy exhibition catalogs if they are worth the money. Current Location: Trying to organize my thoughts - can't you hear the whip? Oh, I will. I can hardly wait for tomorrow! I hope your weekend is absolutely fabulous too! I am most envious - it is certainly not an opportunity to miss! I'll tell you all about it early in the week if it was any good. Oh my, how wonderful that some of these statues are available for us to see in person. Please report back on the experience! I'm totally stoked to be able to see this. If I were still a kid, I'd be bouncing in my chair - LOL. I will absolutely tell my LJ list and blog followers about the experience next week! Man, I would LOVE to see this! Don't suppose there's a chance in hell the exhibit will come our way, despite our close ties with China. I've been fascinated by the warriors for years, love the fact that each face is totally individual and seems to have been modelled on an actual warrior - like being able to step back in time. Just --- enjoy! It's hard to say where exhibits go, they take years of negotiation and planning to get contracts signed and schedules nailed. Maybe it will come your way. I'll tell about it next week in one of my blog posts. What a great opportunity for you! Looking at something so far from the past is almost magical. Just imagine, whoever made that statue had a home and maybe a wife and a whole story that we can only dimly see. I love the Minneapolis Museum of Art. They had (and this was about thirty years ago) a statue called "woman with a veil" that mesmerized me every time I saw it. I've got a replica sitting on the top of the piano, even as we speak. The Institute of Art is quite amazing and only charges for special exhibits, not for general admission. Students and patrons can go through the exhibit halls sketching and photographing (no flash allowed) as they want (photos are restricted in special exhibits like the Terracotta Warriors). It's a friendly and nurturing environment and I love going there. It'll be awesome. You and I have had discussions before about archaeology and the sense of a person that you can get from holding something made by hands from ancient times. The ghosts of the past can live in the present through their material items. It is without doubt one of the things I most loved about archaeology. Now if I could have done all of that without playing into the politics of the various excavations and team leaders... Oh well, water under the bridge. Thanks! It's going to be AMAZING! I can't say I'd call them "art work" since they were certainly not designed for that, but the artistry and capture of actual living persons and animals in paint and terracotta is incredible! Certainly worthy of "art" status. The tickets weren't dirt cheap, $20 for each, but they weren't so bad that I wouldn't pay it. I've been known to travel to other cities to attend specific exhibits. Museums are near and dear to my heart. 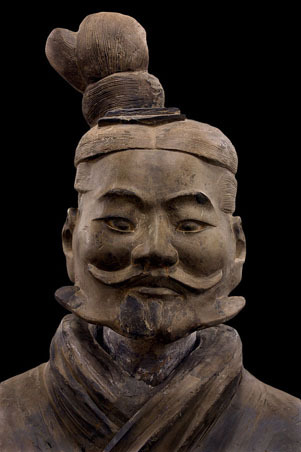 Love the terra-cotta warriors! My son saw an exhibit in Toronto a few years ago and bought me my own small warrior. Will have to take a pick for you. It was a wonderful exhibit and we had a great day. I'll be showing museum pictures in posts later this week, but have a couple of pics on my post today. Such a fun time!